In 1948, America’s greatest folk musician, Woody Guthrie – known for “This Land Is Your Land” and numerous other songs about American life and the plight of working people -- penned a piercing ballad about Oregon’s worst disaster, Vanport. “Vanport’s Flood,” he called it. The song is the only known Guthrie song about the Pacific Northwest outside of the “Roll On” Columbia River songs he wrote for the Bonneville Power Administration (BPA), Guthrie experts say. It also may be one of his last important creative efforts before Huntington’s Disease took its toll on his ability to write and play music. Vanport historians say its lyrics touch on important, still-controversial truths about the Vanport tragedy. The song was lost to history after its publication in a long out-of-print 1963 songbook, even as Vanport and Guthrie have remained noteworthy. Portland Mayor Charlie Hales declared May 30, 2016 a “Vanport Day of Remembrance,” and there will be a second in 2017. There’s been an article in the Smithsonian Magazine, The Skanner documentary series called the “Wake of Vanport” and events by Vanport Mosaic. Zita Podany authored a book of photos, and Portland Community College professor James Harrison is working on a history. 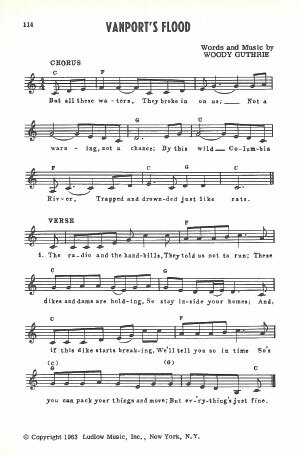 The sheet music was published in “The Nearly Complete Collection of Woody Guthrie Folk Songs,” by Ludlow Music, copyrighted 1963. The Woody Guthrie Center shared sheet music after a reporter investigated a throwaway reference in a 1969 Oregonian story. “I had never known that this had ever been published in any form,” Seattle musician and former BMI Foundation / Guthrie archives fellow Joe Seamons said. Seamons shared a copy of Guthrie’s original typewritten lyrics, but didn’t know of the published sheet music. Sitting in a Northeast Portland cafe and staring at the sheet music, Vanport survivor and community liaison for diversity initiatives at Portland State University Ed Washington smiled, then shook his head. Several times, Washington began speaking, then stopped, fascinated, his gaze returning to the paper. The song’s lyrics tell the story of the May 30, 1948 flood in classic Woody Guthrie fashion, describing a complicated moment historians are still working to unravel. The flood destroyed what was then the second-largest city in Oregon — the largest housing project in the nation — in minutes. Trapped and drownded just like rats. Despite reassurances in a “DON’T GET EXCITED” handbill slipped under doors by the Housing Authority of Portland that morning, a railroad dike owned by Union Pacific caved in around 4 p.m. Vanport residents scrambled to save children and precious possessions and escape churning, fast-moving waters. Many Oregonians risked their lives to save Vanporters from the churning waters, or opened their homes to survivors – but some, The Oregonian reported the next day, showed up to stare and eat popcorn. “It was basically a spectator sport, if you will,” said PCC’s Harrison. He noted that the song’s lyrics contained symbolic details. “When you mention rats, one of the things that the ex-Vanporters reported, there was a rat problem there. There were thousands of rats that were seen scurrying out during the flood,” Harrison said. According to Guthrie’s daughter Nora, he was living in Brooklyn at the time the flood took place. In an email exchange with The Skanner’s reporter, she suggested he read about the flood in the news. Guthrie never recorded the song. At the time of its publication in 1963, he was suffering from Huntington’s Disease, an inherited neurological disorder that gradually robbed him of his ability to play, write or sing music. He died in 1967. Guthrie’s lyrics are notable for the way they describe possible racial discrepancies in the way the flood was handled – and for its racially inclusive, working-class spirit. The Housing Authority of Portland, which managed Vanport after Kaiser built it, segregated Vanport by race. Vanport Mosaic’s Laura Lo Forti notes that the handbill mentioned in Guthrie’s lyrics, shoved under the doors of Vanport residents, may have been distributed primarily to White residents. All that remains of the 668-acre city is chunks of concrete foundation from the Vanport Theater, if one knows where to look, and an “Oregon History” sign near a MAX station. The official death tally was 15 – but some who’ve studied the history believe it could be higher. Harrison seems to favor a number higher than official tallies but smaller than hundreds. “The sheriff at the time of the flood in June of ‘48, made an estimate that there were probably fewer than 50 [deaths],” Harrison said. The work ethic and rebuilding spirit in Guthrie’s lyrics is, perhaps, an appropriate elegy for a hastily-built wartime community experts said proved to be ahead of its time. Historians and residents have noted the community’s progressive features like a free, 24-hour, seven-day child care center, shaped like an octagon. While Vanport residences were segregated by block, community facilities like schools and businesses were integrated – in contrast to Portland at the time. “The first Black professionals came out of Vanport,” said Moore. That includes sheriff’s deputies, teachers, firefighters. Portland State University, second largest in the state, traces its roots to Vanport. Thacher Schmid writes a blog, medium.com/@PoorforaMinute.